John Byerly advises clients on the full range of international aviation issues, including negotiations, economic and environmental regulation, aviation safety and security, government relations, and strategic planning. John graduated with highest honors from the University of North Carolina, studied European and German law on a Fulbright Scholarship in Berlin, and received his JD from Yale in 1979. 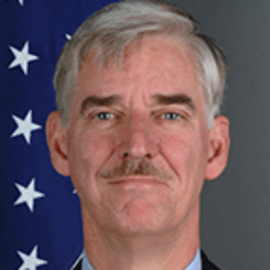 Upon graduation, he joined the State Department, serving thirty-one years in positions addressing American foreign policy, national security, and international economic relations. For almost a decade (2001-2010), John was the Deputy Assistant Secretary of State responsible for market-opening air transport agreements with over 70 countries and led U.S. delegations in talks that secured Open Skies with Germany, France, the European Union, and Japan. He was active in the economic, legal, and environmental work of ICAO and helped implement the U.S. response to the terrorist attacks of September 11, 2001.